Doctor Who: Revisiting DRAGONFIRE | Warped Factor - Words in the Key of Geek. 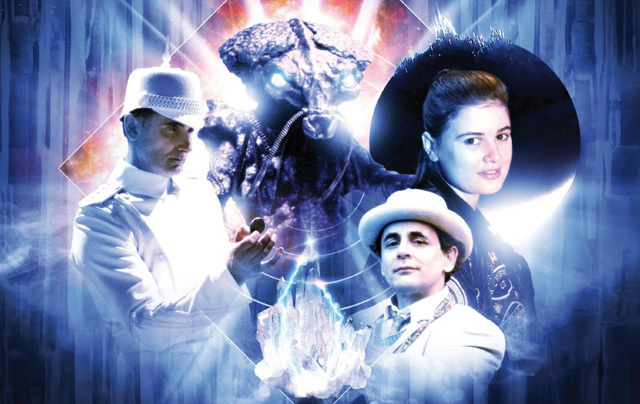 Dr. Moo revisits the 7th Doctor's first season finale, Dragonfire. Okay, there’s an elephant in the room. Let’s talk about that cliffhanger. Barely a mention of this story goes by without some discussion of it so let’s deal with it now. Brace yourselves; it’s edge of your seat stuff! 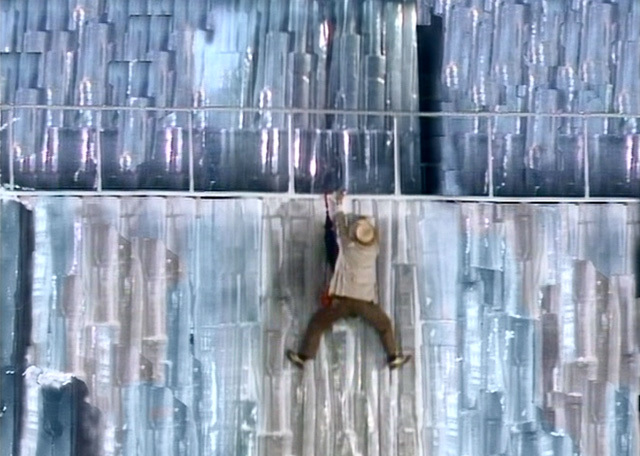 You thought The Pandorica Opens or The Caves of Androzani had good cliffhangers? Wait until you see this! The Doctor sees a wall and hangs off of it from his trademark umbrella for some obscure reason. Told you it was a good one! And how is it resolved? By Glitz simply walking to the lower level and helping him down MEANING THERE WAS AN EASY FOOTPATH OPTION ALL ALONG!!! So apparently that wasn’t even meant to be the cliffhanger! While Mel and Ace being threatened by the titular Dragon is standard ClassicWho fare for cliffhangers, the Doctor being an idiot is not. But if we accept what those responsible say, that this was a case of direction not doing justice of the writing, then we need not dwell on it any longer. It’s certainly something we can look back on and laugh at now and it’s even iconic enough that the footage was reused for 2013’s The Name Of The Doctor, so credit where it’s due there. Speaking of annoying things let’s talk about incumbent companion Melanie Bush. And enter Ace. But don’t be fooled, the deep and layered character we know and love is not yet fully formed, and Sophie Aldred gives probably her weakest performance here relying on her ability to scream (which seems out of character watching it with knowledge of Ace’s future appearances) and shout the word “ACE!” for no reason. Still, everything we all love about the character is here – the tom-boyishness, the Nitro-9, the coat and calling the Doctor “Professor” – It just needs some time to develop itself and let Sophie get to grips with the character. Give her a baseball bat and a Dalek, problem solved! Then it… it just sort of ends. I wish I could go into more details but it’s really that forgettable. There’s a treasure hunt and a lot of corridors, some running around and an explosion. On paper it’s a great experience but in practice, like most of season 24, it doesn’t seem to gel. 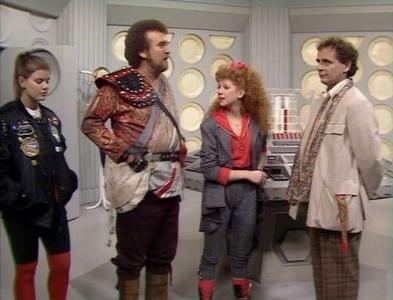 If you want a classic piece of Doctor Who that will satisfy you and leave you wanting more then Dragonfire is not it. What you will find here is a memorable introduction for Ace and an equally memorable exit for Mel. That’s all this story sets out to do, so in that respect it’s certainly a success. By its end we have freed the Doctor of Mel and now the 7th is teamed up with Ace instead – Would anyone have him any other way? – and the only way left to go now is up. The definitive TARDIS team of its decade has been set-up and for the first time since, arguably, Lalla Ward’s Romana II we have a wholly likable companion on board. Time to let Sylvester loose and see what he can do. Bring on the Daleks! Well? Do you fancy a quick trip round the twelve galaxies and then back to Perivale in time for tea?